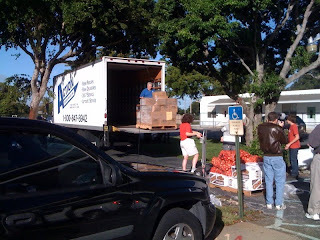 12/19/2009 Each year Action Courier Service helps provide holiday meals for hundreds of families in southern Florida by trucking pallets of food from the Goodwill distribution center in West Palm Beach to a Delray Beach church for sorting, packing and distribution. C.R.O.S. Ministries,www.crosministries.org on behalf of The Caring Kitchen organized the pickup and distribution efforts of fresh and frozen food consisting of frozen hams, bread, fruits and fresh vegetables. We provided an expert driver and a 26 foot box truck with a lift gate. This year the food distribution was allocated to a much larger number of families in need compared to last year. For information on how you can help, contact C.R.O.S. Ministries at: www.crosministries.org. How do I ship fuel samples?